It APPEARS to look as though it is RE4 control scheme. And it LOOKS badass! Last edited by Darkness; 06-12-2018 at 10:43 AM. Yep, just woke up to this this morning. I was very sceptical hearing about this originally and in the lead up to seeing this video. But I'm very impressed so far, I need to see some actual gameplay before I decide 100%. But up to now, all is looking total badass. If the gameplay is as seamless and atmospheric as the trailer I think they might actually pull this off. I like the renditions of Leon, Claire, and Marvin. Now where are the clickbait headlines? "ELZA WALKER CONFIRMED FOR BIOHAZARD RE:2"
Wow! They are giving us an elza costume?! I can't F*cking believe it! Being able to swap to the original OST is probably easily the best way to get me to spend more money. Also, In the trailer there's an RPD Officer, young looking, He looks like ROY. Wearing the ARMOR too like him. Last edited by Darkness; 06-12-2018 at 10:57 AM. While I know people want RE3 to evt. become its separate thing, if/when a remake is done, but I really do hope and wonder if there'll be deliberate ties to RE3 planted in this remake and if any elements from it will appear. we saw ada too in a way. anything else hidden in the trailer that anyone else noticed? Last edited by P.I.M.P. ; 06-12-2018 at 01:07 PM. There's always the potential that Jill could land as a DLC campaign, and I'd be happy with that, although it would require like 75% extra work to do all the other environments, unless it's intentionally being built like that from the start. In one way or another RE3 is tied to RE2, you can't change the setting of the game, it would make sense to incorporate Jill into this version since making a Nemesis game would partially use these assets anyway. Just call it Resident Evil 2 Remake: Nemesis, I don't think people would care too much as long as the campaign was there. Am I the only one who was kind of disappointed with the results??? I thought Leon looked a bit like DMC Dante. The new character designs is wierd but it's something I can get used to. It's nice to see the female zombie, I hope they keep them in as homages to 1.5. That was one of my favorite scenes in the trailer; the cop zombie swarm. I hope this remake will reimplement more of the 1.5 gameplay concepts as well. I love how the environments are much darker and more claustrophobic. I’m trying not to let my enthusiasm create unrealistic expectations but I was thoroughly impressed by the E3 presentation. anything else in the trailer that anyone else noticed? we hear hunk on the radio but then also leon...do the two meet each other? Omnomnom on yo’ face, Leon. I mean, obviously you can't take the trailers at face value, but it appears in the gameplay trailer that Leon approaches the RPD from the same direction that Jill does, from the "south-east" instead of the "north-west" (relative to the RPDs entrance). It appears that there is a longer street section than usual, however in the rat trailer you can see that the tanker explosion still occurs, so it's unsure looking between the two trailers just how the street layout is mapped. The question is which traler came first, because each trailer contradicts its self. 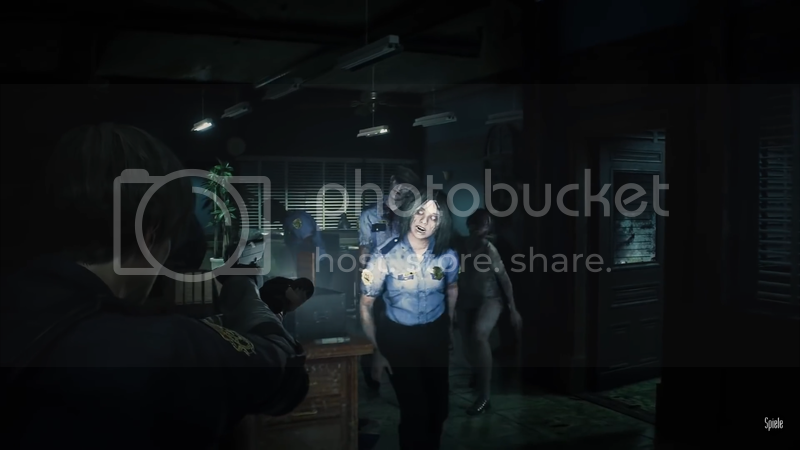 It's interesting that they've created a shot taken from the same angle that Jill comes from, it has no relevance to core RE2 but they put it in there anyway. I don't see any other street sections such as the ones at the back of Kendo's gun shop, but I do see the tanker explosion and I do see the bus, so there seems to be a mix of material there, the big question being why is Jill's angle shown off so early in a trailer. The dream would be multiple scenarios, Leon, Claire, Ada, Jill and Hunk. I'm leaning on the side that Jill might actually be represented in this game, purely because of her camera angle being one of the first things we see in the reveal, that took a lot of thought. 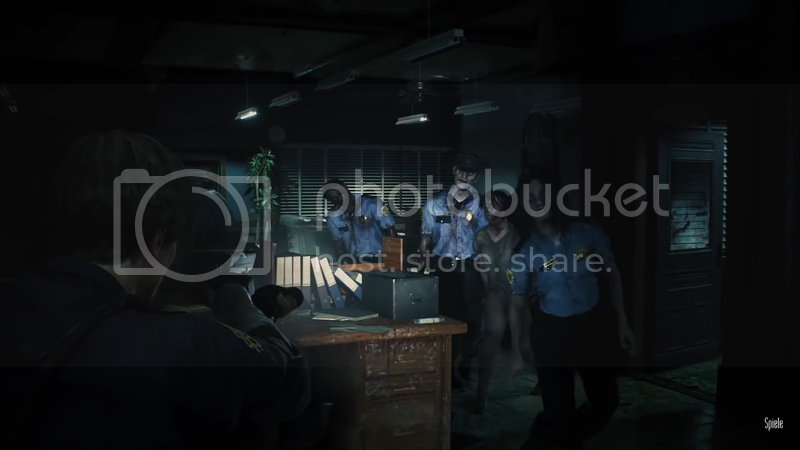 It is a convenient camera angle that shows off the whole RPD, something that doesn't happen in RE2, so perhaps it's just context and fan service, but there are of course other ways of doing those things, as we've seen with the odd 1.5 reference. I'm overall happy with what I see, it has a very dark and super gory atmosphere, a lot like the Darkside Chronicles, I thought the gore factor in that game was spot on so seeing that they've turned it up to 11 sits good with me. For now, yeah I'm happy with it. Is Leon half Japanese? What's his ethnicity? Half Italian? I vaguely remember him being mixed race. Last edited by geluda; 06-12-2018 at 04:55 PM.